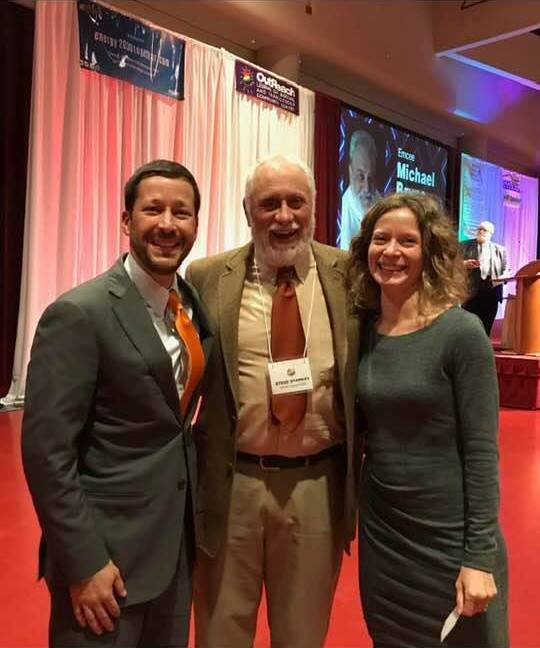 David Koehler, left, OutReach Executive Director Steve Starkey, and Elizabeth Koehler celebrate the work and legacy of Bill Wartmann at OutReach's 26th annual awards banquet. Those are the words of Bill Wartmann. Bill and his wife, Joyce, were well known for their extraordinary generosity toward the people and causes they loved—the arts, learning, helping the underserved, parks, history, the lesbian, gay, bisexual, transgender, queer (LGBTQ) community, and more. Madison Community Foundation had the privilege of working with Bill to create the William and Joyce Wartmann Fund for Centro Hispano, and the Wartmann Endowment for Silverwood Park, located in their hometown of Edgerton. This past summer, we learned of Bill’s passing, and soon after, that he made one final gift to Madison Community Foundation through his estate—$1 million to create the William J. Wartmann Fund for OutReach. What Bill’s gift means is that every year, $40,000 to $50,000—and growing over time—will go to OutReach LGBT Community Center, helping create a community where the presence and contributions of the LGBTQ community are welcomed and celebrated, where intolerance is challenged and defeated, where justice prevails, and where the civil rights of all people are valued and respected. Bill believed deeply in the mission of OutReach. MCF is honored to support the work of OutReach and humbled that Bill entrusted our organization with such an important responsibility. We are also proud to hold an endowment for New Harvest Foundation, which exclusively supports organizations working to promote LGBTQ rights, and to support organizations such as the Gay Straight Alliance for Safe Schools through MCF’s Community Impact grantmaking. Bill left a legacy to permanently invest in the people, organizations and causes that captured so much of his passion. Our community is stronger today because of OutReach, and Bill Wartmann’s legacy is forever reflected in the hope it brings to tomorrow.